Perched amidst the Garhwal Hills of Uttarakhand, Lansdowne is a quaint little hill town that not many tourists know of. Off the beaten tourist trail, Lansdowne is an untouched, pristine town, miles away from the hustle and bustle of the city. Situated at 5670 feet above sea level, Lansdowne is more famously known for being home to the Garhwal Rifle regiment of the Indian Army. This hill station is neither commercialised nor heavily urbanised, making it the perfect getaway for anyone looking to take a break amidst peace and solitude. The local population of Lansdowne is surprisingly somewhere around just 20,000, and almost all the buildings in the town are fading reminders of the colonial era. The town itself gets its name from the then Viceroy of India, Lord Lansdowne. Surrounded on all sides by towering snow-capped mountains and lush green forests, Lansdowne has a pristine ambience that lures a steady number of tourists all year round. Being detached from the race of urbanization and commercialization, Lansdowne has an extremely laid-back air around the entire town. You can always check into a hotel, but the real atmosphere of Lansdowne is experienced by staying in the guest houses at the military cantonment itself. All these guesthouses are extremely reminiscent of the colonial period, and they offer a stunning view of the mountains from their balconies. If you would like to explore the wilderness of Lansdowne, many tour operators organize jungle safaris into the heart of the forests where you can catch a glimpse of Himalayan wild animals in their natural habitat. Bhim Pakora can be reached after a 2km trek downhill on a rough path and the place is quite surprising as there are two big stones one above the other in perfect balance and while the stone can be moved with a finger it never falls down. Tip N Top, also commonly known as Tiffin Top, is a small hilltop viewpoint that is located at 1700 metres above the sea level and provides visitors with magnificent, breathtaking views. This famous attraction is located just 1. 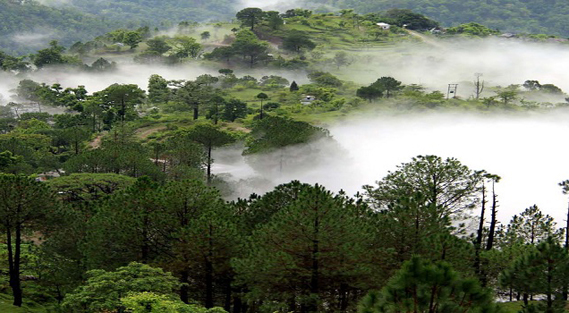 5 kilometres away from the main city of Lansdowne and is the centre of attraction of the entire region. The name itself suggests that the place is the highest point in all of Lansdowne, and the attraction is like heaven reincarnate on Earth. It provides visitors with splendid panoramic sights not only of the entire city but also of the nearby forested area, and the Garhwal Hills with the majestic Himalayan range in the background. Imagine waking up to see the complete skyline and Shivalik Range in front of your eyes: the Tiffin Top offers precisely that. Tip N Top is visited by thousands of people each year, who visit the place to experience the peace and calmness that the area offers. The location is especially popular amongst honeymooners and newly married couples who get to spend some marvellous moments with their significant other in the midst of the romantic setting of the hills and the tall trees. The night stay that tourists can enjoy at Tip N Top is like a dream come true, and the experience is indeed out of the world and unparalleled. Words fall short while explaining the pure tranquillity and serenity that people who visit this place enjoy. The pine and oak trees that abound in the lush green forests further add to the beauty of this already charming place and enhance its overall appeal. All in all, Tip N Top is the perfect place to visit if you want to spend some quiet and peaceful moments either introspecting all by yourself, or in the company of your loved ones. Located atop a hill at 2092 meters, Tarkeshwar Mahadev Temple is believed to be one of the ancient holy sites or SiddhaPitas dedicated to Lord Shiva. The Mahashivarathri festival draws a huge crowd from across the country. Named after Victoria Cross holder Darwan Singh Negi, it is a historical defense museum located near the parade ground in Lansdowne. This beautifully decorated two storey building has a collection of arms, uniforms, rarest photographs of army generals, certificates and details about the origin and achievements of Garhwal Rifles. Established in 1923 The Garhwal Rifles War Memorial is located at the parade ground and is known as the proud of Landsdowne. Located at the Mall Road this Catholic Church was built in 1936. The beautiful interiors and green surroundings of the church attract tourists and make it a must visit destination. One of the most favorite picnic spots among locals and tourists, Bhulla lake is a well maintained serene lake made and maintained by Indian Army. Bhulla lake is loved for it's tranquil atmosphere as it is not much populated and there are ample boating facilities available here. An amusement park is located nearby which is quite popular among kids.